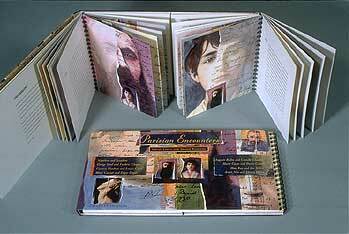 This book uses a "French door" binding to tell about the relationships of eight famous couples who met in Paris. It includes pastel/monotype portraits of each couple, eccentric biographies and maps of Paris showing the spot where each couple met. Published as a trade edition by Chronicle Books. Out of print but available from the Artist at $25. Signed copies are available. To order, click here. showing where the couples met.